The Giro Seam is a long-standing favorite helmet for skiers looking for great ventilation and comfort. A single large Stack Vent keeps air moving across the top of your goggles to eliminate fogging. The Thermostat Control utilizes 12 vents to regulate your temperature, should you start to overheat. Vertical Tuning helps the Seam be very compatible with other goggles to adjust the fore and aft tilt, even though it has a seamless compatibility with all Giro Goggles. Giro has added an X-Static Anti-Microbial Padding that keeps your helmet fresh for seasons to come. An In Form Fit System provides up to 4cm of adjustment for a perfect fit. If you are looking for a helmet that has its own look, with the protection you need to ski day in and day out, the Giro Seam is the helmet for you. great helmet with one exception. Q: Is this helmet light, how much does it weigh? A: This is a very lightweight helmet, depending on the size it's going to weigh in around 15 ounces. Q: What is the difference between the Seam and the Nine? I'm most concerned about air flow to goggles, vent adjustability and XL with maximum melon room! A: The XL on both the Seam and the Nine models are fit for a head circumference of 62.5-65cm. The main difference in the 2 helmets is the Giro Seam offers the X-Static padding which contains a fiber made with layers of pure silver which offers a greater microbial protection to reduce odor and regulate heat. Q: is the sizing true to what is shown on the sizing chart? A: The size chart is up to date and accurate to the measurement of the helmet. You will want to take a measurement of the circumference of your head and pick a helmet with a size which fits that measurement. Take into consideration if you plan on wearing a hat beneath the helmet. Q: Are the ear pads removable? A: The ear pads in the Giro Seam helmet will be both adjustable and removable. Q: any XL in stock? 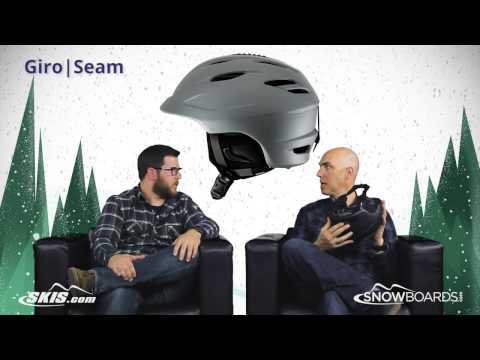 A: At this time we only have the Giro Seam helmet in sizes Small through Large available. Q: Does this helmet actually come in X-Large as the size drop down indicates (it's greyed out, I am assuming that it is not in stock but available). Please let me know . . . if it does come in X-Large, when do you expect to have stock?